The increase in global population, urbanization and industrialization is resulting in the conversion of cultivated land into wasteland. Providing food from these limited resources to an ever-increasing population is one of the biggest challenges that present agriculturalists and plant scientists are facing. Environmental stresses make this situation even graver. Plants on which mankind is directly or indirectly dependent exhibit various mechanisms for their survival. Adaptability of the plants to changing environment is a matter of concern for plant biologists trying to reach the goal of food security. Despite the induction of several tolerance mechanisms, sensitive plants often fail to withstand these environmental extremes. Using new technological approaches has become essential and imperative. Plant-Environment Interaction: Responses and Approaches to Mitigate Stress throws light on the changing environment and the sustainability of plants under these conditions. 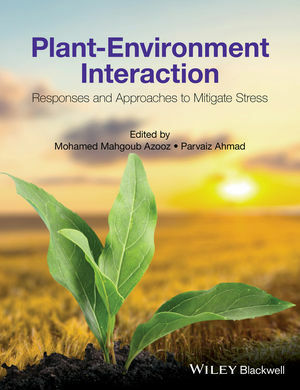 It contains the most up-to-date research and comprehensive detailed discussions in plant physiology, climate change, agronomy and forestry, sometimes from a molecular point of view, to convey in-depth understanding of the effects of environmental stress in plants, their responses to the environment, how to mitigate the negative effects and improve yield under stress. This edited volume is written by expert plant biologists from around the world, providing invaluable knowledge to graduate and undergraduate students in plant biochemistry, food chemistry, plant physiology, molecular biology, plant biotechnology, and environmental sciences. This book updates scientists and researchers with the very latest information and sustainable methods used for stress tolerance, which will also be of considerable interest to plant based companies and institutions concerned with the campaign of food security.